PDF is considered as the best format among the other publishing medium. The PDF documents can be viewed properly in an electronic media as the required fonts and images are embedded into the PDF file itself. Beside PDF is ideal for publishing ebooks and reports in any digital publishing mediums and operating systems. A PDF documents is compact and all the formatting is preserved. But the problem is some PDF files are not editable & readable for sharing information. There are several technologies, tools and software’s which can make a PDF searchable and editable. A searchable PDF facilitates users to edit PDF files, combine multiple files as one, add signature images to PDF pages, fill PDF forms online, add clickable hyperlinks to existing PDF documents and so much more. OCR (Optical Character Recognization) and ICR (Intelligent Character Recognizition) technologies are very useful methods for making a PDF file searchable and editable. There are also various application & softwares available in the market to make editable PDF files. Among these some are free and some are paid. Some recognized free applications are PDF Text Online, PDF Unlocker, Open Office etc. Some well known paid applications are A-PDF Password Security, simpo PDF to word, Tweak PDF to word, Quick PDF to Word, Quick All to PDF, Quick Word to PDF etc. Global Associates has been providing compact searchable PDF document creation and processing services since 2002. 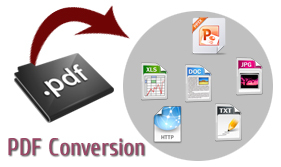 Global Associates offers cost effective PDF creation, searchable pdf creation and scan to pdf services. Global Associates utilize state-of-the-art Optical Character Recognition (OCR) technology and adobe tools to scan PDF files and recognize text from source raster image and image only PDF files and convert them to digital files. Later on these digital texts can be exported by saving the PDF files in different searchable and editable formats like .doc, .dwg, .jpg, .html, .psd, .rtf, .xls, .dgn, .tif, .png, .bmp, .txt and .ppt. Global Associates can also generate PDF files from hard copy documents (paper documents, spreadsheets, websites, emails) and from various number of electronic formats (Microsoft word files, rtf files, html files, tiff, tif, jpeg and gif or image PDF). While converting PDF files to editable & searchable documents, Global Associates conserves relative positioning of tables, images, and even multicolumn text, page and paragraph attributes as well as bitmap images or vector graphics all at once. Thus originality of the PDF document is sustained for reviewing, sharing, archiving, and printing. After completing the whole process, extensive quality control and inspection is performed to ensure the same high-degree of accuracy of data and image quality. PDF documents are transmitted directly to clients through high-speed FTP connections that are securely maintained including Virtual Private Networks. We are also ready to carry out a no obligation sample work for searchable PDF creation services to ensure the quality of our work.